(1) the midsegment connecting the midpoints of the two sides of a triangle is parallel to the third side and (2) its length is also half of the third side. In this post, we prove these two theorems. In the given above, is a triangle and is a midsegment. The segment connecting the two sides of a triangle is parallel to and half the length of the third side. 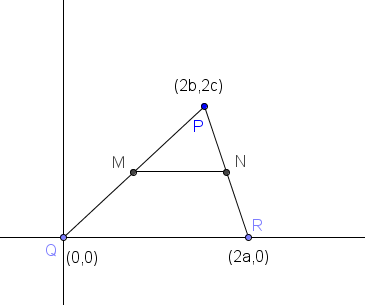 Let be a triangle with points , , and having coordinates , and respectively as shown in the figure above. Since and have the same slope, they are parallel. We have proved the first theorem. Now, it remains to show that is half that of . I didn’t know about these midsegment theorems, but you have done a good job demonstrating the proof!